If you pay for water by meter you will be billed on either a monthly or a quarterly basis on our Metered water tariff. Your bill will consist of charges for the water you have consumed and a daily standing charge. 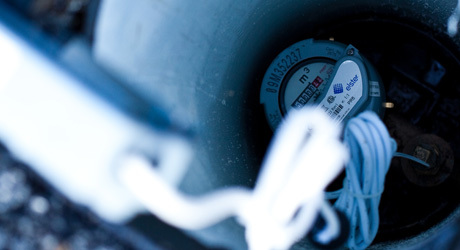 We will read your water meter to measure the volume of water that you have consumed (measured in cubic metres (m³) 1 cubic metre is 1,000 litres). Your charge for water will be calculated using the number of cubic metres consumed multiplied by the current charge per cubic metre. All of these details will be shown on your bill so that you can keep track of the water that you are using. It may on occasion not be possible to read your meter every month or quarter and if this is the case we will estimate your consumption based upon previous consumption patterns in your property. The standing charge is the amount paid for being connected to the water network (whether water is consumed or not). The standing charge tariff is set annually and will be calculated daily, the amount will be shown on your bill. If you pay your bills by Direct Debit you will also receive a credit of £1 per bill against the total value of your bill. If you would like to pay your bills by Direct Debit click here for further details. There are other charges that may appear on your bill from time to time. These will be as detailed on the Schedule of Tariffs and Charges and explained in the Terms and Conditions of supply.